Preheat the oven to 400 deg F for 10 min. Meanwhile, Clean the potatoes and tap them dry using a kitchen tissue. Coat them with olive oil, salt and pepper. Arrange the coated potatoes in a baking tray and pierce them with a fork on all side for uniform baking. Place them inside the heated oven. Bake them for 25 min. After baking check with a fork or knife. It should be soft. Allow it to cool for 10 min and cut the potatoes into two halves, either horizontal or vertical. I cut them in horizontal style. Using a spoon, scoop inside of the potato leaving a small thick wall and transfer to a bowl. Mash the scooped potato. Add chili paste and salt. Mix them well and set aside. Meanwhile, mix the ingredients given in "Stuffing" section except sour cream. Mix them well and allow it to rest to 5 min. Then add sour cream and give a stir. In the potato shell, first add the mashed potato and give a light press. Then add the prepared stuffing. Arrange them on baking tray. Top each stuffed potatoes with Parmesan cheese. Again bake them for 8 min and broil for 2 min. Keep an eye on your potatoes while in Broil. Ragi Roti is a very healthy and tasty food. This can be prepared in minutes and can be served as breakfast or snack. Ragi roti can be made little thicker or thinner. If you make thick patty, make sure that the inside is also cooked well. More onion added to this roti will give more flavor. And also if you are preparing for kids, you can skip green chili. In a large mixing bowl add ragi flour, salt, onion, green chili. Mix them well. Add water and make it into a smooth dough. I used my food processor for preparing the dough. Them make small balls from the dough. Heat a pan. Now take little oil in the palm / polythene sheet / banana leaf. Place the small ragi ball and tap them to form a small circle. Transfer it slowly in the heated pan. I usually tap them directly on the pan. keep in medium flame. When one side gets cooked, turn to other side. It usually takes little longer time to get cooked in the middle. If they turn white, just grease with little oil. Manathakkali known as "Black Nightshade" in English is always known for its wonderful health benefits. It is called as Kaachi Soppu in Karnataka. This plant is an important ingredients in Indian medicines and the fruits of these plant is used in the treatment of Asthma. This vathal Kulambu is prepared from dried fruits of black nightshade. This is a very easy dish and it taste great with white rice and appalam. Try this tasty kulambu for a tasty lunch...!! Dry roast all the ingredients given in "to roast and grind" until a nice flavor comes out. Then allow the mixture to cool down for sometime. Grind it into a smooth powder using a blender. I added coriander cumin powder to the mixture instead of seeds. Extract juice from tamarind and set aside. Heat a pan with oil. When oil becomes hot, pour the vathal and roast them for 30 sec. Transfer the fried vathal to a plate. This step is to remove bitterness from the vathal. Now in the same oil, add the ingredients given in "to temper" section one by one and fry them for few sec. Then add chopped onion. Saute them until it turns soft. To this add pinch of turmeric and a dash of salt. Pour the tamarind juice and bring it to boil. Add the prepared vathal kulambu powder and give a good stir. Bring the mixture to boil and add the roasted Manathakkali Vathal. Keep in low-medium flame for 15 min or until kolambu gets thickened and oil gets separated. Hash brown is a easy quick potato recipe. Shredded potato are pan-fried. It is served during breakfast with bread roast and omelet. I prepared this in combination with bread roast and Egg Omelet Roll. Hash brown is crispy on the outer surface, they are soft and fluffy on the inside. You can also make them as separate circle shaped pieces. Flavor hash browns with salt and pepper while serving or can be added while frying. Clean the potatoes in water. Remove the skin of potatoes and grate them. Heat a frying pan and grease them with cooking oil. When pan is hot, reduce to medium flame. Then spread the grated potatoes over the pan. You can make them into two or three small circular shapes. Temper with salt and pepper. Color of potatoes will start changing to a darker color as it gets cooked. Check whether the other side is roasted to golden brown color. Then flip them to the other side and roast. Transfer it to plate with tissue to remove excess oil. Serve with bread roast and Egg Omelet Roll...!!! In a blender put all the ingredients given in "to grind". Make it into a smooth paste by adding little water. Transfer it to a bowl. In a small pan, heat oil and roast all ingredients given in "to temper" by adding them one by one in the mentioned order. Add it to the prepared chutney and serve. Serve with idly, dosa, ragi dosa, rava dosa etc. Sunday is incomplete with out Biryani....!! And here is a easy recipe for chicken biryani. Its a great combo with pepper chicken and raita. In this recipe, I combined and grind all the ingredients. So we can prepare this biryani quickly. I used 1:1.5 ratio for rice:water, depending of the brand and quality of basmati rice. Sometime it needs 1:1 ratio or 1:2 ratio. I did not soak the basmati rice. If you soak the rice, reduce quantity of water. Note: The amount of spices that I have specified is mild. Those who need more spicy Biryani can add little more. In a mixing bowl, add all the ingredients given in "to marinate" section and mix them well. Set aside for 20 min to marinate. You can also refrigerate for marination. Now grind all the ingredients given in "to grind" section in a blender into a smooth paste without adding water. Heat a pressure cooker/pan with ghee and oil. Then add Cinnamon, cloves, bayleaf, cardamom, star anise powder or as pieces. I used them as powder as i do not like them to see while eating ;-). Pour the grind paste into the pressure pan. Reduce the flame and saute for few minutes. If you are preparing for large group, you need not reduce the flame. Saute until it gets thickened and oil starts separating. Put the marinated chicken into the pan, increase the flame and saute them until chicken pieces turns white. To this add coriander cumin powder, garam masala and mix well. Now pour 1 and 1/2 cups of water. Adjust salt. As the water begins to boil, add the cleaned basmati rice into the pressure pan. Allow the rice to get half-cooked. As it gets thickened into a semi-solid state, close pressure pan lid. Pressure cook for 1 whistle and quickly switch off the stove. Do not over-cook otherwise it will become mushy. Let pressure release naturally. Fluff with a fork. Here is a twist to the regular egg omelet with onion. This small egg omelet rolls is loved by kids and its great to serve with bread roast. Egg omelet roll can also be served as snack or appetizer. Egg is always a very healthy dish and it is one of the few foods that contain vitamin D. Most common method of preparing egg are omelet, hard-boiled, scramble and this egg omelet roll is a different presentation of the egg. Take a large mixing bowl to whisk the eggs. Break and pour the eggs into the bowl. Then pour milk and whisk them together for few minutes. To the whisked egg, add onion, carrot, spring onion and mix them well. Add salt and pepper. Beat them until everything gets mixed well. Heat a pan and grease it with oil. When the pan gets heated, pour the egg to a thin layer. Keep in low-medium flame for 2-3 min or until it gets almost cooked. Start rolling from one side. Once 2/3 of the omelet is rolled, drag the rolled omelet to the middle and then pour rest of the egg. Wait till the later poured egg gets cooked and roll again into a complete roll. Transfer the rolled egg to a plate and allow it to cool for sometime. Then cut them into small pieces. Serve with Bread Roast and Hash Brown ..!!!! Mushrooms are a low-calorie food and Cilantro are fresh aromatic leaf... 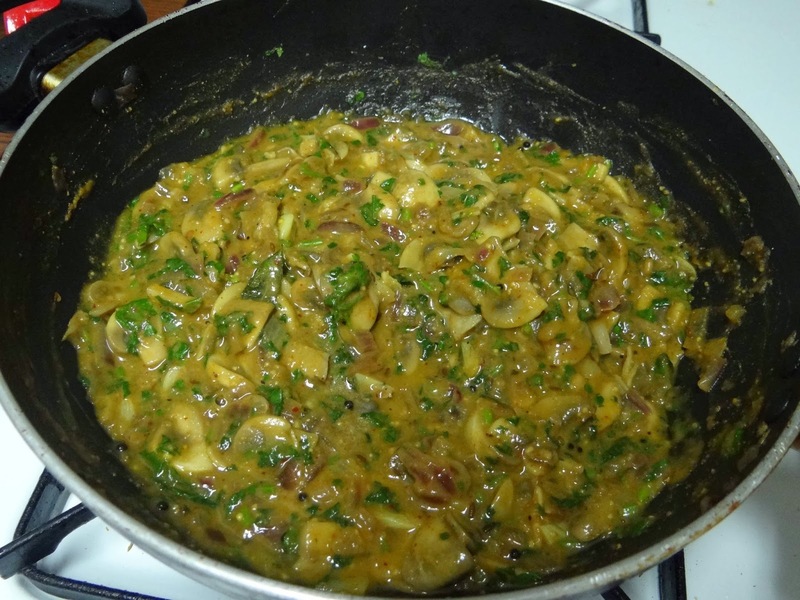 The combination of mushroom and cilantro makes a very delicious side dish. It just takes few minutes to prepare this delicious dish. A very easy recipe and a different combination. Cleaning the mushroom: Wash the mushroom in running water. Wipe mushroom surface with a clean towel or paper tissue to remove the dirt and water. Do not put mushroom inside the water. Cleaning Cilantro: Rinse cilantro a bowl of water twice or thrice until all the dirt and mud are completely removed. Heat a pan and dry roast all the ingredients given in "to dry roast and grind". fry them until a nice flavor comes out. Then allow them to cool and grind into powder. Then heat the same pan with oil. When its hot, add all the ingredients given in "to temper" one by one. Saute for a min. Add onion and saute for 2 min. Add salt while sauteing. Then put a pinch of turmeric powder. Saute till onions becomes soft.Then add cleaned and cut mushroom in the sauteing pan. Keep in medium flame for 2 min. As mushroom gets cooked, it shrinks and become soft. To this mix cilantro and quarter cup of water. Then combine grind masala powder and coriander powder. Give a good stir until everything gets mixed well. After 3 min, transfer to the serving bowl. Mushroom Malli goes well with idly, dosa, chappathi..Try this different recipe and enjoy the flavor and taste. Check ragi roti recipes which are equally yummy..!!! Soak urad dhal for 2-3 hrs. Grind it into a smooth batter as we prepare for Idly Batter. Mix 2 cup of Ragi flour for 1 cup of urad dhal batter and make it into a soft batter by adding required water. It should be like idly batter neither too thick nor too thin. Add salt as required. Allow it to ferment for 10-12 hrs or overnight. After fermentation batter gets fluffy, gently stir the batter and it will be in right consistency to be used. Now heat a dosa pan and pour a scoop of batter. Roll in circular motion as we prepare regular dosa. If you need crispy ragi dosa, sprinkle little oil over the dosa. Turn to other side when its cooked. Crispy Yummy tempting and also a very very healthy Ragi Dosa is ready to serve.